Customization can be a wonderful thing. In the case of your Facebook News Feed, it might mean the difference between confronting a daily onslaught of adorable baby photos and actually getting content you want to view. The social network added a new feature today that will allow users to designate a group of accounts that will automatically appear at the top of their News Feed. 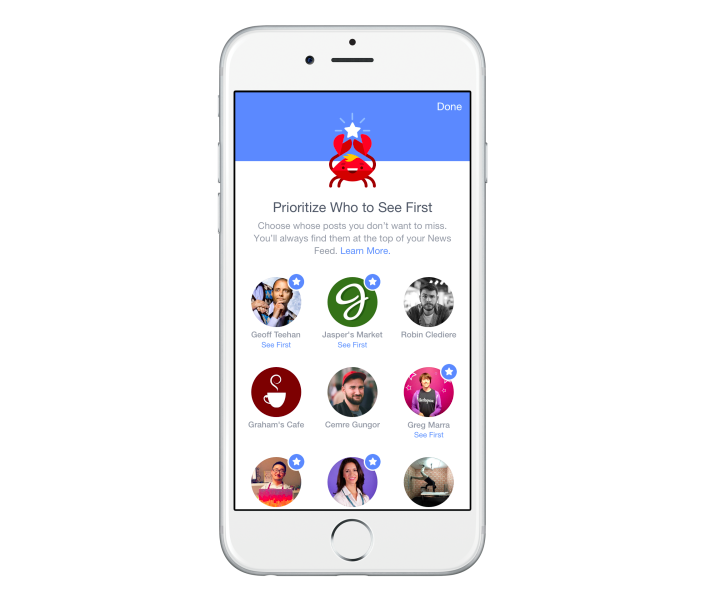 The “See First” option that launched today allows people to identify up to 30 people or pages whose newest updates will appear at the top of the News Feed every time that users opens Facebook. This is a departure from Facebook’s often confounding algorithm that it uses for determining what people want to see in the News Feed, a change that Facebook itself points out in the blog post announcing the new setting. While you can always click through options on a post that pops up in your News Feed to make it go away or simply have that kind of content appear less often, that doesn’t always guarantee you will or won’t see something like it again the next time you’re on Facebook. But noting that “ultimately you’re the only one who truly knows what is most meaningful to you,” Facebook says it’s giving more control to users over what they see. Fancy that! This could be bad for business, Re/code points out, as Facebook relies on people scrolling through their feeds to make money on showing ads to users. But that’s a risk the company is willing to take to please users and keep them coming back for more, a spokesperson explained to Re/code. See First and other changes in the Preferences section will hit the Facebook app today in an update for iOS, and will roll out to Android and Web versions of the social network later. And if you’re wondering how you’ll ever fill those 30 slots, might we ah, ahem, humbly suggest you add the Consumerist Facebook page to your list? We promise not to fill your feed with adorable baby photos, unless they are pictures of a newborn wheel of cheese or a wee gaming system in its infancy. So. Cute.